This week I’m featuring The Colour of Murder by Julian Symons, one of the books I’m currently reading. It was originally published in 1957 and is one of the British Library Crime Classics reprints. In his introduction Martin Edwards states it was one of the most acclaimed British crime novels of the 1950s. It focuses on the psychological make-up of man accused of murder. It all began one day in April when I went round to change a library book. At least, that is the time when it seemed to me to begin, though I know you people trace things a lot farther back, and I’d like to say that I don’t believe in all that. Whatever a man does, he’s got to take responsibility for his own actions, that’s what I believe. I don’t see how the world can run any other way. I have to say that, even though I know it may be against me. John Wilkins meets a beautiful, irresistible girl, and his world is turned upside down. Looking at his wife, and thinking of the girl, everything turns red before his eyes – the colour of murder. But did he really commit the heinous crime he was accused of? 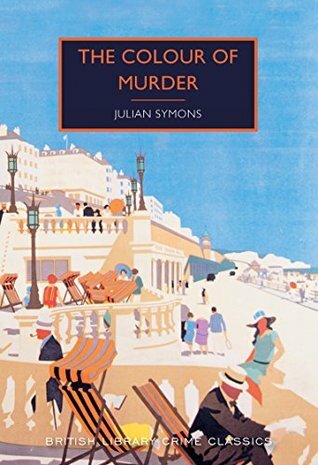 Told innovatively in two parts: the psychiatric assessment of Wilkins and the trial for suspected murder on the Brighton seafront, Symons’ award-winning mystery tantalizes the reader with glimpses of the elusive truth and makes a daring exploration of the nature of justice itself. I haven’t read anything by Symons before, but I’m enjoying this one so far.